I’m sure there are going to be some bugs (I’m way less fastidious about cross-browser happiness when it comes to my own stuff than I am with other people’s sites), so if you happen to discover anything weird, please do let me know what operating system and browser/version you’re using so I can address the problem! Oh, and there’s a new FAQ page. The link page is taking a nap right now, but it’ll be back soon enough. IT’S THE BLANKET!!! IN MY HOUSE AND ON MY BED!!! YAYYYYYY!!!!! 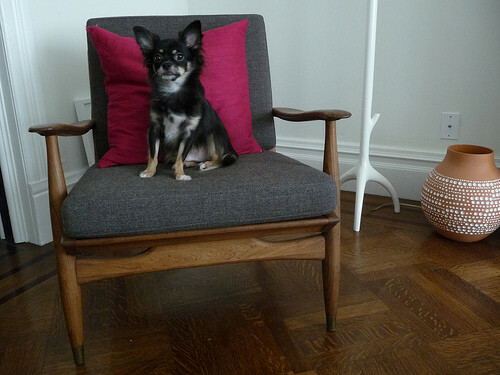 If you’ve been reading this blog for a while then you know I am completely obsessed with Pia Wallén’s Crux blanket. I dream about it. I refer to it for proportional guidance when painting medicine cabinets and cord cozies. Basically, I talk about the Crux blanket incessantly to anyone who will listen. About six months ago, I found out that the original wool version of the Crux blanket is no longer being produced—once the current stock is gone, it’s gone. Despite the fact that the wool blanket is prohibitively expensive (the price being the sole reason I haven’t upholstered my entire house with them), I did get a little mopey…until I learned that it had been replaced by a far more affordable (but still spendy, let’s be real here) cotton flannel version. Blah, blah, blah, months of waiting and pondering and bribing of toothy Chihuahuas…and then I thought the blanket sure would be a nice birthday present from Evan (he agreed)…followed by more months of me agonizing over committing to the actual purchase. A couple of weeks ago, though, I finally went ahead and ordered my very own Crux blanket from the superfabulous Juli and John at Mjölk in Toronto. Their service could not have been faster or kinder, and they even tweeted a photo of my blanket being packed for shipping! And yes, I do realize I’m talking about a blanket here. Humor me, OK? It’s just sooooo soft and thick and luxe and perfect…and it’s reversible, so it’s really like two blankets in one. And did I mention it’s soft? As much as I would have loved to have put it on the living room sofa and made it available for snuggling at all times, I am all too aware of Fritz’s reputation when it comes to blankets, so the bedroom it is. Totally fine with me. Carpenter ants, you say? Painted kitchen floors, I say. Yes! Love it all. The crux blanket and the cruxes on your blog. 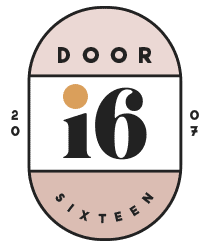 Is that a door symbol in the d of the Door 16 circle? Love the little details. Nice, clean. Abstract. I like that. Personally, I think that all blankets should be made of wool (for warmth), but sometimes I think I might be too old fashioned about these things. You’d be surprised by how thick and warm this blanket it! If I didn’t know differently, I’d think it was felted wool. l-o-v-e the new design! great job! gorgeous redesign with the perfect little washi tape detail…. i too have had the new crux blanket on my radar but have been less successful with my husband. we have that same $12.99 black and white throw from ikea ( http://www.ikea.com/us/en/catalog/products/60174950/ )on our bed which he thinks is pretty fancy. we also have sheets full of rabbit holes so i’m not sure a crux blanket – no matter the price – is really necessary. i shouldn’t say that about the crux though. i hope lightning won’t strike me. I totally hear you on the rabbit holes!! Except ours are Chihuahua-holes. This is my first comment but i had to let you know, about the Ikea blanket. I was at Ikea just 3 days ago and i fell in love with that blanket you have. So cozy and soft, but well made and sturdy at the same time, except for the tassels, don’t like them, so i opted for another blanket, thinner, not so cool and without the tassels. IKEA really has some great blankets!! I have this one, too, and it’s very good quality. So, how long did it end up taking you to categorise all your posts? Site design is rad BTW. I did that for a whole year, but I’m not sure it makes sense any longer since I haven’t had time to seek out new blogs! I will be implemented a links page, though…just as soon as I sort everything out. lovely blog (redesign), lovely blanket! It’s beautiful! I love the little 3rd column on the left hand side. The header was unexpected (not that I really knew what to expect) but still screams “Anna”. And oh, I have serious blanket envy right now. XO, Kathleen. Congrats on the redesign. Looks amazing! it all looks great Anna! what a great blanket // great inspiration for a blog redesign. i love it. It’s not just a blanket, it’s the blanket and one that definitely deserves a few paragraphs devoted to it. It looks amazing in your bedroom, with the black wall in the background. I love the little crosses on the blog too! I love the new design Anna! I’m so happy you finally got your Crux blanket, it looks wonderful! Ohh, I love it! And *I* was mopey at first because when I saw it I thought “Oh, it’s probably wool.” (I don’t buy wool), so I am extra excited about the new version! Still pricey, but at least I can consider it. the new design looks really great. also, I have now become equally obsessed with said blanket-thanks 😉 hurrah for you for new blanket ownership! *Happy Kermit arms* at the new design and of course, THE BLANKET! But question? The blanket doesn’t have it’s own archive/category listing? It’s the little things, right? I think the blanket is divine! the site looks absolutely beautiful, anna. and i’ve got some serious blanket envy going on over here. Yay! Oh, looks so good!! Look at you, all grown up with your third column! LOVE the new layout! Very nice. I love it! Love the simplicity, which is hard to get right I think. I like that it’s not really a three column format, but the post info on the left really nicely balances the page. Does that make sense? Anyway, at first I was worried that I didn’t see any colour especially ‘your’ colour. When I clicked not he post link I was pleasantly surprised, there was the Anna neon pink I was looking for. Toronto is my hometown so if you ever want me to go to Mjölk and look at anything in real life for you I can! It’s only a 10 minute walk! And I totally agree: blankets are important. Love the blanket …I can understand the obsession. Also like the new look of the blog. I’m partial to very clean simple looks. You always seem to do the right font selections too, I have a tough time with that, don’t have the eye for it. I love the new design, especially for the individual posts. You’re always keeping it snazzy and simple! Congrats, Anna – the re-design looks lovely. Nicely done. Found a bug…of sorts. When you’re on the FAQ page and you click on the About Me page it gives me an error message. Looks like the link might be wrong? What do I know really. I’m using Chrome and my OS is Ubuntu 10.04. Love your work Anna – especially the header pattern. Love the little detail of capitalising in the comments too! Happy new year! Yeah, my dogs are really into the digging thing, too! Fortunately they don’t really venture upstairs unless they’re coming up with us, so I think the blanket is in a safe spot. the blog redesign is just beautiful!! i am loving & enjoying all the little details that you added/changed. simple with just enough quirks to make it visually stunning. Yay for you! Love them both! Happy New Year! the redesign looks fantastic. and the blanket is beautiful, very clean and sofisticated. I liked your FAQ page and how the answers just scrolled out beneath the question. happy new year! So happy that you got your blanket. All things DO come to those who wait (and save and hand wring). Love it in orange too. Happy New Year! Looking forward to continued inspiration from you in 2012. Love the redesign (the door symbol in the D is so clever), and of course that gorgeous blanket! Lucky you. Congratulations on your blog makeover! I like it al lot, even though I also liked the old one! Happy New Year! Love your new design and your blanket. Have a Happy New Year, hope 2012 brings you happiness and joy!. Love the new design and, of course, that blanket! Love the new blanket. Definitely have blanket envy . . . I have an obsession with all sorts of covers for my bed to begin with. Now there’s a holy grail to wish for! Also, the new look is great! 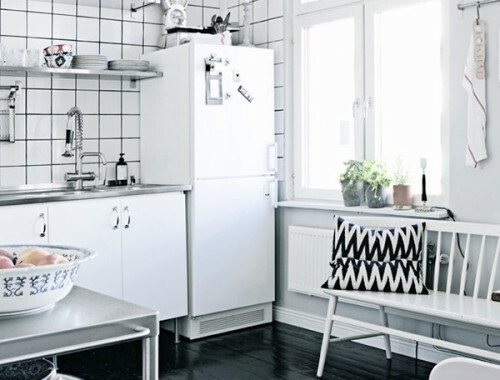 It’s so Anna, you have such an identifiable style from your interiors to your dogs to your blog everything is so graphic and clean and cool. Eeek!!!!! Happy new year to me!!! That blanket is also my one object of obsession so the more blanket talk, the better IMO. It looks perfect in your room. Im headed over to those crazy design kids’ site to look at them now. Love the new blog look too! Looks great—both the blog and the blanket! Love the blog redesign, it’s so crisp! And way to go on that to-do list! I was also off for a week and only succeeded in watching far too many episodes of Big Bang Theory and cooking superfluous meals/sweets just so I could give a holiday present a good test run. Little late with this reaction, but it looks absolutely lovely. You’re inspiring, you know! Oh, my! That shop has all sorts of loveliness in it. And the redesign is wonderful too!!! Funnily enough, yesterday I was out for a walk on Dundas (in Toronto), and spied that blanket through the window (they were closed). And then I happened upon your posting last night. It’s a beautiful store – so many tempting goodies. Happy New Year Anna! Love your new blog design! Am so happy to know about the more affordable version of the blanket – have been yearning for one myself…maybe in February when I am a little more flush with cash! Oscar and Sadie send new year greetings to cousins Fritz and Bruno! Hi Anna! Love the blog redesign! And the blanket of course looks amazing. Glad it arrived quickly and that it’s everything you wanted it to be! It of course fits right in in your home. All our best for 2012!!! The shelf over your bed is perfect. And the blanket was worth every freaking penny – gorgeous!